Sometimes we have a table like the one in Figure 1. It looks good. But for a more formal look, you might want all the rows to be the same height. Too often, I see people "trick" up the row height by putting extra empty paragraphs into the table. So, you might click after Hobart and press Enter twice. That's not a good way to do it. A better way is to specify the height of the rows. You probably don't want the first row to be as tall as the other rows. So select all the table except the first row. In Word 2003 and earlier versions: Click within your table. Table > Properties. 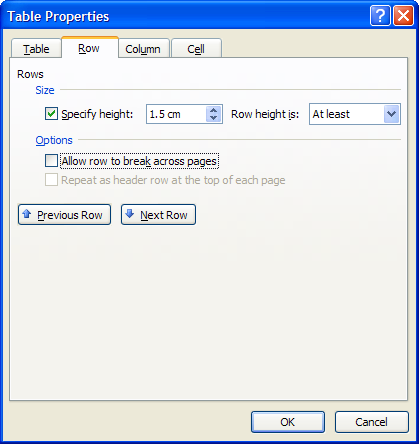 Within the Table Properties dialog, click the Row tab (Figure 2).